10ft Sky Dancers® by SkyDancers.com come in a variety of different styles, shapes, and colors for you to tailor-purchase the perfect inflatable advertising product for your business or event. In stock and ready to ship today, our 10ft SkyDancers are ideal for anyone needing a more compact version of our classic 20ft Sky Dancer. 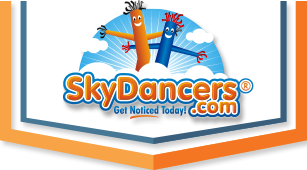 If you're short on space or head-room or just want to utilize a more budget-friendly Sky Dancer®, SkyDancers.com has all your favorite 20ft Sky Dancers in a 10ft size. Trust the inflatable advertising product from SkyDancers.com that many have successfully grown their business with. With the introduction of our 6ft Sky Dancers®, the 10ft Sky Dancers becomes our mid-size model. This mid-sized 10ft Sky Dancer is best described as the versatile model. While not having the extreme reach of the 20ft Sky Dancer, and not having the compact immediacy of the 6ft model; the 10ft Sky Dancer® can do a little bit of everything. Place it in an open space and watch it attract it's excellent share of traffic. Place it in a limited space and watch it amaze with it's height. In either environments, watch the 10ft Sky Dancer excel to promote your business or event.